We are starting to see more scenarios about getting to a “decarbonised” future. One where greenhouse gas emissions are no longer a problem. Many scenarios are forgettable. The good ones have the power to create the change. 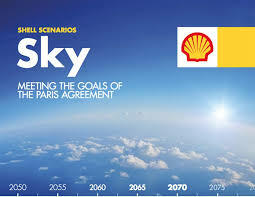 Shell has added a new futures scenario, called Sky, to its New Lens scenario set. I think it has that power. Its purpose is to look at what it would take for the world to meet the goals of the 2015 Paris Agreement on climate agreement. That is, to achieve net-zero greenhouse gas emissions before the end of this century. In case you think that Shell is just pushing it’s own agenda, they worked with The Nature Conservancy, and others, on the scenario. Westpac bank has also just released a report it commissioned that economically models two NZ scenarios for reducing carbon emissions. As both Ralph Sims and James Renwick have commented on the Science Media Centre expert response, the findings of the Westpac report aren’t surprising – the sooner you start reducing emissions the better (environmentally and economically) it is likely to be. However, they rightly praise the bank for taking the initiative and providing analyses to inform discussions. Incidentally, one of the contributors to the report – Vivid Economics – produced some other scenarios last year for achieving emissions neutrality in NZ. In that report they highlighted the need for significant land use changes, shifting away from agriculture to more horticulture and forestry. But I want to focus on Shell’s Sky scenario. It is more interesting because it isn’t just an economic analysis, and goes into more detail. It is ambitious and aspirational, describing a rewiring of the global economy in just half a century to achieve net zero emissions. The terms “ambitious” and “aspirational” are often read as unrealistic. But the Sky scenario makes a good case, in some ways, for realistic. In common with most thinking about reducing carbon emissions, a critical factor is significantly increasing the proportion of the energy system that is powered by electricity (rather than oil and coal). Shell note that currently about 20% of the energy system is electricity. The Sky scenario looks at getting that to more than 50% in the next 50 years. This would require political, social and technological change. There would be greater political support for renewable energy, carbon pricing, and aggressive energy efficiency and emission standards. Most of the land transport would be electric. It sees significant advances in carbon capture & storage, biofuels, and battery technologies by 2030, followed by rapid deployment. The scenario also requires that hydrogen becomes an energy source, at least 10% by 2070. It also requires the continuation and expansion of more traditional practices, such as planting more trees, reducing afforestation, as well as changing agricultural practices to reduce greenhouse gas emissions. There aren’t any magic bullets here. Its a long, hard, unwavering slog, with changes across most of how we currently live. It requires a consumer mindset change, along with multi-lateral collaboration, real long-term cooperation, and a balancing of national self-interest with other nations’ interests. Did I mention that it was aspirational and ambitious? While aspirational, Shell note that on the technology side many of the technologies already exist, although they need improvement. The scenario posits that from now till 2030 will be a capability building and technological maturity phase. From 2030 to 2070 will be more about technology deployment and adoption. The scenario sees this technology as critical to getting to net zero emissions. It is still in its infancy, and there are many critics of it because they view it as a crutch to keep using fossil fuels. We are starting to see carbon capture and storage being used, particularly at coal plants. However, the economic viability of these with current carbon pricing is poor. The Sky scenario imagines that carbon capture will become more common, and a way to transition away from coal and oil, particularly for emerging economies. Coal, the scenario notes, is a “stubborn” technology – hard to supplant because it is cheap and easy to use, and can be utilised to create a range of useful products. Consequently, we need better regulations and technologies to reduce its use and environmental impacts. The scenario is also bullish on hydrogen because it provides a way to replace oil-based fuels used in aviation, shipping, and trucking. Elon Musk calls hydrogen fuel cells “incredibly dumb”, at least as a competitor for electric cars. However, they may eventually make sense for larger vehicles, and as an option for home heating. There may be greater opportunities with algae, or microbes. Although for the latter, there is still significant research and development required. The scenario also expects changes in agriculture and other sectors. In the construction sector, for example, we need to reduce our reliance on cement. That is a big ask. However, a solution may become available, if a recent report on using desert sand as a new building material proves feasible. While not as profitable as oil, it could help the Middle East transition away from oil as a resource. To make significant progress on all of these technologies over the next decade will be challenging, but not an excuse not to try. The political challenges, though, seem the more difficult to overcome. The scenario doesn’t get into how these political changes will come about, except from proposing that economic and social pressures will enable it. (It’s written, after all, by engineering types not political scientists). The authors contrast this scenario with their earlier Mountains and Oceans New Lens scenarios. The Mountains scenario involves a status quo in political power, favouring stability over radical change. Oceans is based around devolved political power and continued capitalism-based systems. At this point in time getting most countries to look beyond their own national interests seems harder than even just a few years ago. Alex Steffen seems to think a revolution is coming, driven by the younger generations who won’t want gradualism. They, he contends, want jobs, not just a good climate. “A giant building boom is what successful climate action looks like. That means jobs. Jobs younger people want and will be better prepared to take up. We can assume that democracies and capitalism, like some technologies, are “stubborn” too – hard to change. But with deteriorating job prospects and economic conditions, radical change can happen quickly. We are already seeing this with the increasing number of authoritarian states. Whether a “youth revolution” would lead to progress or just chaos remains to be seen. What’s the point of scenarios? Often scenarios are viewed as fanciful or flakey stories that reinforce particular economic and social assumptions, and aren’t very good at explaining what needs to be done. Consequently, they can be seen as having little value, and so ignored. While I have skepticism that the time frames in the Sky scenario are realistic, I do see it as an important scenario that warrants careful consideration. It illustrates that change is possible, and the scale of the task. We have a decade or so to get the conditions for change right. A crucial thing is for all of us to make it clear to political and business leaders that the status quo and gradualism aren’t what we, or our descendants, want. We can use scenarios like Sky, and Westpac’s, to energise ourselves and others.